I just returned to the U.S. after five years of living in Singapore and working with philanthropists and NGOs across Asia. As I resettle and reconnect, friends ask how I’ve changed since I left. While there are many things I learned in Asia, I am overwhelmed by how much I missed the “nonprofit-ness” of the U.S. I missed the way the third sector in the U.S. is understood to be a vibrant part of society. I missed the way nonprofits create public spaces for caring, inclusion, and recovery. Nonprofits raise unpopular issues and express opinions that often lead to policy changes. From Black Lives Matter to Mothers Against Drunk Driving, World Wildlife Fund, Special Olympics, or Freedom to Marry, nonprofits create a collective space for conversations that need to happen. These nonprofits spark dialogue and build momentum for shifting public opinion and policy action. Nonprofits open a window into beauty and poetry. Public art, theatre, and dance (to name just a few artistic forms) are critical expressions of our individual and collective identities. Diversity is increasing in every country and the process of how “they” become “us” is often described and facilitated through the arts. Small and large nonprofits alike give us a taste of the uniqueness of other cultures, even while we identify universal themes. Nonprofits hold space for new, outside, or “other” artists that might not get distribution in market-mediated venues. Nonprofits can also establish ideals for leadership. The magnitude of public anger when nonprofit scandals break is in direct proportion to the public’s expectation that nonprofit leaders should hold themselves to even higher ethical standards than their counterparts in business or in government. While the sector may not always live up to those standards, it is an important role we in the third sector should embrace. This is not about taking vows of poverty or perfection, but is rather about maintaining critical inquiry of institutions on issues of governance, hierarchy, fairness, and equity. Meanwhile, across Asia the role of nonprofits is being curtailed like never before. NGO voices are being silenced and regulated. And yet in my five years abroad, I regularly met people in China, India, and Southeast Asia who are dedicating themselves to starting and working in nonprofits. And not just to provide services, but to build community. These people — many of them newly-degreed young people — want to build meaning in their lives beyond wealth accumulation. Bucking roles assigned by family or society, they exhibit tremendous strength of spirit in their efforts to build robust nonprofit ecosystems. My time abroad brought into stark relief the critical role our nonprofits play in weaving together the threads of our communities. Sure, we can get a lot better. But absence from this nonprofit community did indeed make my heart grow fonder. Crystal Hayling is former CEO of the Blue Shield California Foundation and a member of the CEP Board of Directors. Follow her on Twitter at @CHayling. Impact Investing: Philanthropy’s New Frontier? 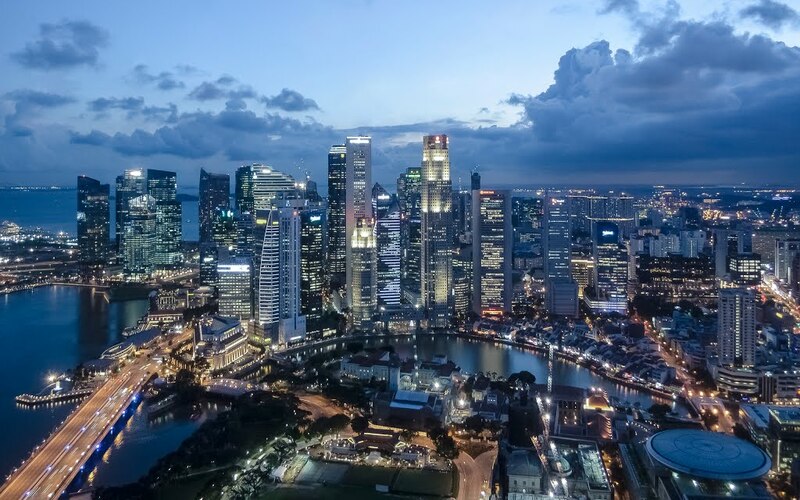 Dr. Judith Rodin, President of the Rockefeller Foundation, recently visited Singapore and hosted a series of talks and meetings to stimulate and support impact investing in Asia. Dr Rodin joined a heavy-hitting panel that included Asian Development Bank, International Finance Corporation, Rangsutra (a social enterprise), Credit Asia Capital, and Impact Investment Exchange Asia (IIX). They addressed a filled-to-capacity crowd at INSEAD business school where 100+ students, investors, philanthropists, bankers and academics listened to their call to action. The speakers outlined what they perceive to be the many benefits of impact investing: social as well as financial returns, side-stepping inefficient or corrupt governments, unleashing entrepreneurism, and building enterprises that can be sustained without philanthropic support. 1) The power of the market is indisputable and omnipresent. Year over year double-digit growth throughout Asia has decreased the percentage of the population living in poverty (though absolute numbers remain frighteningly high) and the creation of a middle class has been achieved and appears sustainable in some countries. 2) Fewer wealthy individuals have ‘cashed out’ of the enterprises that made their money. Wealth is more likely to come from family businesses and ideally successive generations continue to run those businesses. The money feels more like ‘working capital’ than an endowment. 4) Many third generation, high net worth individuals in their 30s and 40s have a finance or investing background. The generation of ‘new philanthropists’ here in Asia are ex-bankers, MBAs, Ivy/Oxford-educated and they feel called to use that unique skill-set to make their social impact. Of course, among the converted sat plenty of skeptics. Many traditional investors questioned the entire category of impact investing—asserting that ‘social’ is another term describing higher risk and that true investors would never pay a higher price than necessary for an investment: everything else is philanthropy. Indeed, the feeling of philanthropy was very much in the air, despite the finance lingo. While some people pitch impact investing with assurances that investors can put money here even if they don’t care about social returns, that proposition rings hollow. The people I’ve met who are intrigued by impact investing care a lot. They are bringing their hearts and their minds to the proposition. And that impulse is very much grounded in philanthropy—from the Greek origin philanthropos: love of mankind. So while some impact investors dismiss the term philanthropy, still others believe they are redefining or adding new dimensions to it. Impact investing—here or anywhere—is not for the faint of heart. Impact investing that achieves broad scale, is a theory that has yet to be fully proved. But it posits an exciting possibility. As such, it requires risk-taking, strategy, patience, determination, humility, and passion. Passion to make a difference and chart new territory. This is not the settled homelands of philanthropy, this may be its new frontier. In the coming months I’ll be interviewing key philanthropists and impact investors in the region to hear, in their own words, some of their successes, challenges, and motivations. I hope you’ll join the conversation. This piece is cross-posted on the @Alliance Magazine website which can be found here. This post was originally published as a guest blog on the Good Intentions web site. Critics argue that these kinds of giveaways harm poor communities more than they help because they flood the markets with free goods which underprice clothing and thereby put local tailors, dressmakers or small clothing companies out of business. But are all clothing donation programs created equal? As an advisor to Ashoka, I was invited to meet Anshu Gupta at a coffee shop here in Singapore to learn more about this fellow’s work. He’s polite and a bit reserved until he starts talking about Goonj, the organization he founded in 1999. Goonj, which serves 21 states in India, receives donated clothing, largely from upper and middle class Indians, and then using hundreds of trained local volunteers, cleans and distributes that clothing to Indians too poor to afford even basic clothing. But the process is far from simple. Middle class women in Mumbai donate jeans. Rural women in Tamilnadu don’t wear jeans. They wear saris. And they might not wear saris made of the same cloth that women from Delhi might donate. So Goonj volunteers have a highly developed cataloging system that allows them to identify, separate and group clothing according to where the recipients can actually use it. In addition, recipients engage in neighborhood-building work in exchange for clothing. Goonj’s community organizers have developed a variety of means of helping communities help themselves using this recycled resource as an incentive, commodity, and exchange. Goonj sees its mission as giving people clothing to help them move toward self-esteem, skills building and self-sufficiency. So the right clothing exchanged for work or expertise in a respectful way, is critical to the model. 3) Organized around the needs of the recipients, not the needs of the donors. 4) Fueled by creative re-use. Their newest initiative is using clean, recycled cloth scraps to make locally produced sanitary pads for poor women. A real public health and sustainability breakthrough. 5) And it recognizes that poor communities are looking to build markets of exchange and value, not destroy them. Those who extend the life of resource are performing an important function in the community’s ecosystem, they are not passive recipients. When I met him, Anshu was asking for assistance in further developing his business model, training other NGOs to replicate the Goonj program, and seeking experienced volunteers to document and write case studies about their work. He was actively seeking support and critique. I was stopped in my tracks by World Vision’s statement that it has never evaluated their gifts-in-kind programs because “they are gifts, not programs.” Wow. There are so many things wrong with that statement that it’s still blowing my mind. My point here is not to denigrate or bestow sainthood on any organization. World Vision is full of smart and dedicated people, so I have no doubt the organization will change and grow, as will Goonj. But this discussion encourages us all to respond energetically to our charitable impulses, while also being open to learning when those impulses might need refining in order to be responsive to community needs. There is no shame in having an idea or program that needs improvement. The shame is in being too close-minded to make the improvements. Please share your ideas for how we might be able to change that. Storytelling is big. Our world seems alive right now with some of our best experts extolling the power of storytelling. Business schools have switched from ‘pitches’ to stories, Dan and Chip Heath’s compelling Made to Stick is required reading for NGO leaders, and politicians keep mining the power of Reagan-stories for inspiration. But let’s be clear, stories are complicated. The reason most of us aren’t regularly regaling people with perfectly timed and eloquently described stories of our lives is because life rarely unfolds that way. It is only upon reflection that we recognize that x led to y, or that ‘this’ was the beginning and ‘that’ was the end. Yet leadership these days seems to demand that we pluck from the whorl of our past a sequence of logical facts that magically blend together into poignant lessons and an inspiring can-do tale. Memory is imperfect…The memory traces can actually undergo distortion. With the passage of time, with proper motivation, with the introduction of special kinds of interfering facts, the memory traces seem sometimes to change or become transformed. These distortions can be quite frightening, for they can cause us to have memories of things that never happened. Even in the most intelligent among us is memory thus malleable. One particularly powerful influence in truth-bending is the desirability of outcome. People are prone to report what they believe the researchers wants to hear or report data that puts them (the subject) in a more positive light. What is critical to note is that over time, people actually believe the ‘adjusted’ facts to be true. Greg Mortenson‘s unravelling is a cautionary tale for all leaders, especially those of us in the social sector where the self-revelatory, enlightening, ever-progressing origin story has almost become a requirement of the job. Where the desirability of outcome may tend towards exaggerated heroism. Seems to me, this individualistic storytelling ‘heroism’ is partly the undercurrent of what distinguishes social entrepreneurs from mere executive directors? True stories are powerful and inspiring. But so are great managers. The most discouraging thing about Mortenson was that he was too focused on being a celebrated founder and not at all focused on being a good manager. He didn’t understand that the inspiration story needs to be followed by the education story: testing one’s theories against data, research and outside expertise. He didn’t understand that the education story has to be followed by the institution story: building an organization capable of acting on the dreams he inspired. And mostly he did not understand that the job of an NGO leader is to surround yourself with staff, board, donors who can build upon AND save you from your own mythology. On December 16, 2010 TikTok+LunaTik raised just shy of $1million making it the single highest fundraising success story of the incredibly compelling crowdfunding website Kickstarter. As you know, Kickstarter’s tagline “Find and Fund Creativity” pretty much sums up their approach: people can post projects/ideas/plays/films/books almost anything, and ask for financial support to get the project done. Investors pay only when sufficient funds have been raised for project completion. And what was TikTok’s record-setting project? To manufacture a wristband that turns an iPod Nano into a wristwatch. Their original fundraising goal: $15,000. So, some might say, TikTok raised close to $1 million to produce a product that already existed on the market. You should know that I LOVE Kickstarter. I have funded a few of their projects – ones with knock-your-socks-off originality and potential for human connection and impact. And have no regrets. But the story of TikTok’s incredible fundraising success raised questions for me about crowdfunding. Some of these questions may have some implications for philanthropic crowdfunding which is also experiencing a meteoric rise. Enthusiasm should not be confused with due diligence. Crowdfunding depends upon friends telling friends. So if a friend sends you a link and says, “I’m really excited about this and you should be too!” it can create a groundswell of activity. A groundswell isn’t inherently good or bad, so how do we tell whether the underlying principle is one or the other? The one-at-a-time nature of a project’s presentation and consideration (often via email or Twitter) means that the ability to compare the strengths and weaknesses of one project idea against similar projects is almost non-existent. It can heighten our belief in the radical uniqueness of the project before us, which may or may not be true. Traditional philanthropy which gathers all the proposals and reviews them side-by-side skews SLOW whereas crowdfunding skews FAST. How do we take the best of both? TikTok offered people a chance to feel like insiders in the creative process of a well-designed product, something more and more people value. It also gave the company a clear indication of product demand. Is there a way to harness the predictive capacities of crowdsourcing to enhance philanthropy and social innovation? Perhaps new giving sites such as Crowdrise, Groupon (with its Kiva partnership) or Philanthroper will show us the way. Updates and information are critical. The fact that TikTok included photos and video from its manufacturing plant in China was probably compelling for people who are interested in being included in the whole chain of production from design to delivery. Crowdfunding is fun! It’s what I like to call excited philanthropy. Ultimately, Kickstarter helps people feel a part of a community of like-minds. That feeling of community is the jet fuel in the “crowd”-engine. And maybe the crowd doesn’t have to do it perfectly every time, just better than the other alternatives. My hat is off to Kickstarter and these other pioneering sites for being platforms for a new type of funding. They are pushing the boundaries of collective thinking and giving. And hats off to TikTok for passing a huge crowdfunding milestone. But I can’t help wonder if any of the 13,512 TikTok investors might feel a little ticked-off when they see me walking down the street in what looks like their million dollar watch. What excites you/gives you pause in the rise of crowdfunded philanthropy? Full Disclosure: My husband works for Apple which makes the iPod Nano. 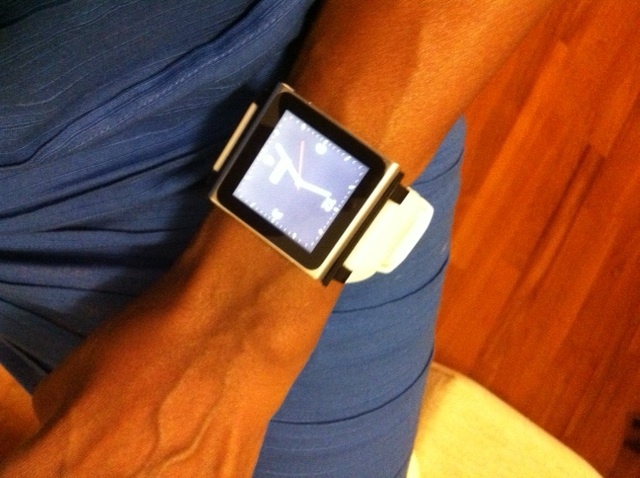 Apple does not make an iPod Nano wristwatch holder.